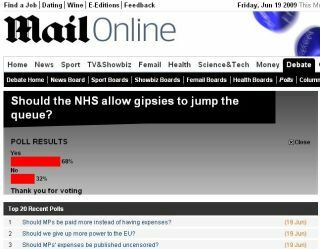 A ridiculous poll from the Daily Mail has been undermined by the internet community, with a huge percentage voting that the NHS SHOULD push gipsies to the top of the queue. With the likes of blogger Anton Vowl (@antonvowl) pushing for people to vote yes, the community has responded by taking a deliberately opposite view to a stupidly leading question. At the time of writing this has led to a huge 'yes' vote of more than 68 per cent, just 20 minutes after it was brought to the attention of the Twitter community. Although the poll does not give amounts of voters, the speed in which the shift happened is a reminder of just how powerful social networking sites are in influencing things. In a week when Iranian connectivity has been the key story, skewing a poll could be seen as no more than frivolity. And yet, in truth, this is a community taking a stand against something they consider ridiculous, and revelling in upsetting the status quo.